iPhone have been always known for their good cameras and crispy photos but its nothing new if all of sudden your phone starts to capture blurry pictures which are out of focus. If you want to know, "why is my iPhone camera blurry?" then keep on reading. This problem can be caused due to many reasons which includes dirty lens, glitchy HDR and maybe software issues. However these problems can be fixed with the following methods once for all. Following are the possible methods that help you fix iPhone camera blurry photos after update, dropping, screen replacement, water damage and any other situations. Sometimes we accidentally touch iPhone camera lens and leave fingerprint marks there, lens can also become dirty which makes photography bit dull and out of focus. Make sure your lens is clean from dirt or debris. Take a soft clean cloth and rub it gently and properly on the lens to get rid of unwanted dirt and fingerprint marks. Cases can cause problem too, if you are using an iPhone case then make sure you remove it while taking photos because some low quality cases that don't fit perfectly makes harder for camera to focus on things. 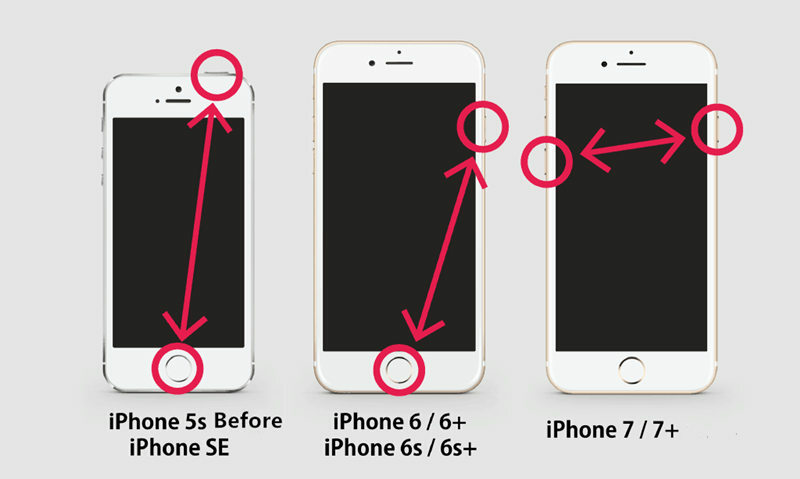 The most common iPhone 6 camera blurry fix is adjusting focus correctly on the object you want to capture. iPhone 6 camera has Auto Focus and Auto Exposure lock feature. This works wonder when your iPhone is having trouble focusing. All you have to do is tap on the object until you see a yellow "AE/AF Lock" box. It will help to maintain focus even you are moving and help you eliminate blur issues. One thing you can try is turning off HDR completely or simply putting it to "Auto", it will prevent double exposures and over bright colors in images. Open your camera you will see "HDR" on top, tap it and select "Auto". Many glitches and problems can be solved by simply restarting your iPhone. It can also solve iPhone camera blurry issue, you can restart your iPhone by simply press and holding "Sleep/Wake" button for some seconds. A slider will show up, slide it to right and your phone will shut down. Once its off, press and hold "Sleep/Wake" button again and it will boot up. If anything else is not working for you then try Hard Reset your iPhone, the only downside to this solution is that you will loose your data and settings so make sure you have backed up your data. You can perform a hard reset by navigating to "Settings> General>Reset", then select "Erase all content and settings" and then finally confirm selection by tapping "Erase iPhone". You can also try Restoring your iPhone from iTunes to solve iPhone camera blurry issue, this method requires a PC and a USB cable. Connect your iPhone to PC and open iTunes on your PC. Select your device when it shows up and then select "Restore iPhone" and wait till the process is completed. If you've tried all the above methods but failed to fix iPhone camera blurred problem, there might be some damage on the camera. You need to get the camered repaired on the Apple Store if the device is still under warranty. However, if you are a tech geek, you can also try it by yourself. Everyone has a bit of photographer inside them, with high end phones and amazing cameras any one can capture some awesome moments. iPhone Camera is quite good and it can take pretty amazing photos if you know how to use it right. Here are some tips and tricks you can use to enhance your Photo taking experience on your iPhone. Avoid zooming as much possible, get closer to by your feet to adjust the correct angle and distance. Zooming via iPhone camera can reduce image quality and will make photos blurry on iPhone. Grid lines are super effective, it divides your screen into 9 parts so you can use composition, use rule of thirds to make sure you have interesting photo. Best practice is to use bot of your hands while taking photos and hold your phone firmly and don't shake it or move it while capturing the photo. If you want to optimize your picture quality and exposure make sure you are using AE/AF lock. You can do that by simply tapping on the object you want to focus and wait till yellow box appears. This will configure and lock focus and exposure so you can take best picture you can. Firstly make sure your HDR is on "Auto", one tip you can use is only using HDR while taking pictures of Landscapes. It optimizes exposure by taking 3 pictures quickly and sorting out correct exposures with better lit environment. No one wants to take pictures in dark or direct sunlight, proper lightning can make a great difference. iPhone stock Camera is quite good but using a third party app that comes with more settings and image processing is a game changer. Some apps like Snapseed allows you to adjust photos in very detailed manner, this app is developed by Google and it is one of the most promising photo editing app out there. This one is pretty simple, just don't use them no matter how cool you think they look but in reality it makes pictures worst. By this I mean, Photography rules, be artistic and experiment different things, sometimes a blurry background having the effect looks awesome, over exposure, low saturation whatever makes your picture good try it out and be creative in your photography skills. iOS System Repair Tool ReiBoot is an awesome tool for any iOS device out there, it is packed with many awesome features and takes care of many system problems with few simple steps. It enables iPhone users to fix various common iOS stuck issues like iPhone/iPad stuck in recovery, DFU, restart loop etc. It also allows you to enter and exit recovery mode with single click. The most amazing thing about this tool is that it takes care of all your iOS problems without deleting your data. It is one of the best investment you can do on your iPhone and we recommend you to must use this awesome tool to fix any sort of system issues. This was an extensive guide on how to fix iPhone X/8/7/6/6 Plus camera blurry followed by some photography tips and tricks which can enhance your photo taking experience and allow you to capture some amazing moments with your iPhone.